Since several of the current Canon dSLR cameras – such as the T4i/650D (and T3i/600D), 60D, and 7D – share similar features and an 18 megapixel sensor, it can make it difficult and confusing to decide which one is best for you. But each one is designed for different levels of photographers with specific needs, and there are significant differences that may or may not be important to how and what you photograph. Obviously as you pay more, you get more, and this article will explain what that “more” is and help you decide if you need it. If you are new to dSLR cameras, know that things like 9 cross-type AF points and dual Digic IV processors aren’t feature-bloated “bells and whistles” or marketing hype, but are important features for how advanced photographers work and they provide the capabilities that some demand from their equipment. If your needs don’t demand them, don’t be swayed to invest more in a camera that provides far more than you require. It won’t help you take better photos, and in fact may cause you to take worse photos until you figure out how to properly take control of a more advanced camera! This comparison post has grown organically as new models have been released, so please be sure to look through the entire post to find the section that best applies to you, such as T2i vs T3i, or 60D vs 50D, the Canon 5D Mk II, or the overall Canon EOS 7D vs. 60D vs. 600D / Rebel T3i comparison which is the main point of this post. Don’t miss the Which Canon dSLR is Right for You summary at the end of this article! Rather than add the T4i into this post, I have written a new post to introduce and explain the features of the latest Rebel, the T4i – Introduction to the Canon Rebel T4i / EOS 650D. The additional features of the T4i make the decision between the T4i vs. 60D more challenging than ever, and so I wrote more about that in Canon Rebel T4i vs EOS 60D. I know there is a lot to read, but you are preparing to spend a lot of money, and this post will thoroughly explain the differences of these cameras and help you decide which one if right for you! Even if some of these models become outdated, the majority of the information and comparison factors remain similar, and it is still worthwhile to read this article before heading over to the T4i articles. If you haven’t yet committed to Canon and are interested in comparing the Canon 60D vs. Nikon D7000 , or the Canon T3i vs Nikon D5100, or the entire Nikon line-up, have a look at those posts next. Sensor and Image Quality: As I said above, all three cameras share a very similar sensor with 18 megapixels, and so their image quality and low light performance will be virtually the same. All are capable of taking professional quality images. Exposure Metering: The threecameras all share the latest 63-zone, dual-layer exposure metering system and 4 metering modes. That means they will all determine the exposure virtually identically and enable you to take properly exposed photos in most every situation, including difficult back-lit scenes. The size of the areas metered for Partial and Spot metering vary slightly between the cameras, but that isn’t anything critical. Autofocus: The 60D shares a similar autofocus system to the T3i and the previous 50D, with 9 focus points and three auto focusing modes. However the 9 AF points of the 60D are more sensitive/ accurate than those of the T3i: all are cross-type in the 60D, only the center is cross-type in the T3i. This means that the outer focus points of the 60D will do a better job, in difficult focusing situations, of quickly and accurately focusing on the subject. This may include, for example, lower light situations or tracking moving subjects. The T3i does a stellar job of focusing, but if you are highly demanding or are going to be primarily shooting action and motion, this is an important difference to consider. The 60D autofocus system in turn is much less complex than the sophisticated AF system of the 7D with its 19 AF point system and its additional Zone, Spot, and Expansion area modes. If you shoot serious sports, action, birds, wildlife, etc., then you are going to want to consider the highly capable autofocus system of the 7D. With its additional AF points and the ability to group them in various ways (Autofocus Area Modes), as well as the multiple Custom Functions that allow you to customize exactly how the AF system works, it is ideal for sports and action. These Custom Functions can dictate how it tracks subjects, how it deals with objects that come between you and your initial subject, how quickly it responds to these changes of possible subjects that are at different distances from you, etc. The entire AF system of the 7D is a bit complex, and will take some studying and experimentation if you wish to fully understand and take advantage of it. However, if you are not an avid sports photographer, a wildlife shooter, or someone who understands, needs, and will use the elaborate features of the 7D AF system, then this shouldn’t dissuade you from the 60D. I have written an additional post about Taking Control of Your Canon Autofocus System. Construction: As you can probably figure out from the prices, each camera is not built the same. The 60D has relatively strong construction of an aluminum frame and polycarbonate body. It is better built than the stainless steel frame with polycarbonate body of the T3i/ 600D but not as strong as the 7D’s magnesium alloy construction. The 60D also has some amount of weather sealing – more than the 600D/T3i, less than the 7D. But for most users, including even those using the camera daily or in travel situations, the construction of any of these cameras is far more than good enough, strong enough, and durable enough. But if you are going to be working extensively in dusty or moisture-heavy areas or situations, you will want to seriously consider the extensive weather sealing of the 7D. While the strong magnesium construction of the 7D is impressive, that is not really needed by many people other than pros who intensively use their cameras in photo-journalist or constant-travel type situations. ISO: Since they all share a very similar sensor, the ISO sensitivity and performance at high ISO settings is virtually the same for these three cameras. But don’t take my word for it, don’t be swayed by pixel peepers on forums, instead check out the camera sensor tests at dxomark to verify this. As you can see, they all share the exact same overall score, and show very similar performance. Controls: As with construction, the buttons and controls vary significantly with these cameras. Unlike the T3i, the more advanced 60D and 7D have nearly every control an advanced photographer needs on the exterior of the camera and they also have the top LCD panel and rear Quick Control Dial that are not on the 600D/T3i. Do you find yourself constantly changing the ISO, the metering mode, or the autofocus mode to adapt to changing situations? Then you will want direct access to these controls and the ability to more easily monitor them on the top LCD panel. Or do you generally work in one of the more automatic modes and not need to deal with these settings? With all the cameras, any controls can also be easily accessed with the Q button and Q menu or in the other menus on the rear LCD monitor. The top buttons of the 60D set only one setting each, so this is less complicated (but thus less versatile) than the multiple-setting buttons of the 7D. Canon has removed the white balance (WB) button on the 60D that the 7D and 50D have, but that isn’t a big deal – use the Q Menu. Another change on the 60D is that the Multi-controller has been moved from the thumb joystick like the 7D and 50D and placed in the middle of the rear Quick-control dial. This doesn’t change how it functions, and should just be a matter of getting used to the difference. (Unfortunately, I still really do prefer the old design and location, though I find it is easier to quickly and accurately click on the diagonal directions with the new 60D Multi-controller design). If you plan on using your camera on Auto or Program most of the time, then the controls of the T3i are more than sufficient for your needs. If you work in Av, Tv, or M modes and need quicker and more direct access to your controls and the additional top LCD screen to view and change your current settings, then you need to look at the 60D or 7D over the T3i. Brief commercial interruption: I want to mention that I have written e-book user’s guides for the Canon 7D, Canon 60D, Canon Rebel T3i, and Rebel T2i. After spending so much time studying, experimenting, writing about, comparing, and discussing these cameras, I decided to put all that knowledge into e-book form! Each of these user’s guides cover all the features, settings, and controls – but more importantly when and why to use them in your photography. This includes metering modes, aperture and shutter priority modes (Av and Tv), advanced autofocus use, and more. They also describe all the Menu settings and Custom Function settings – with recommended settings. Take control of your camera and the images you create! Canon 7D Experience, Canon T3i Experience, Your World 60D and T2i Experience. Learn more about the e-books by clicking on their titles or on the covers below. Wireless Flash: Like the 7D, the 60D and the T3i both incorporate wireless flash triggering. It allows you to trigger multiple off camera flashes at different output levels. The older 550D/T2i does not have this feature. 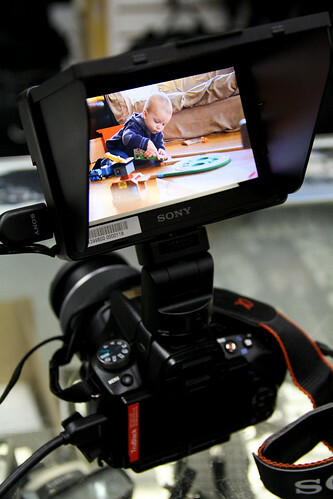 Articulating LCD Screen: The big new feature that the 60D and T3i have that the 7D and T2i do not is the articulating rear LCD screen. This may prove useful for videographers, as well as for setting up compositions while the camera is on a tripod, for macro use, or for using it from unusually low or high vantage points. Some users will be able to avoid buying an expensive angle finder because of this feature. There is also an electronic level in the 7D and 60D, visible in the viewfinder, rear LCD, or top LCD. Viewfinder: The 60D has a large, bright pentaprism viewfinder with 96% coverage of the actual resulting image, better than the pentamirror and 95% coverage of the 600D/T3i, but not quite as nice as the nearly 100% view of the 7D pentaprism. Processor: The 60D shares the same Digic 4 processor as the 600D/T3i. The 7D has dual Digic 4 processors. However, if you don’t need to shoot dozens of continuous images, you probably won’t notice any processing speed issues. Continuous Shooting Speed: The 7D can shoot a blazing 8 frames per second, in which the photos barely change from frame to frame. The 60D can shoot a respectable 5.3 fps which is actually a more useful rate, and is a higher rate than the 600D/T3i rate of 3.7 fps. If you need the extremely high fps for sports, wildlife, or other action shooting, consider the 7D. If not, don’t be swayed by this excessive feature that is designed for people like pro sports or dedicated wildlife shooters. However, if you are shooting any type of sports, action, birds, dance, etc., the 5.3 fps of the 60D is much more useful than the slower T3i. Memory Card: The 60D uses the SD memory card like the 600D/T3i, not the CF card of the 7D and 50D. This doesn’t really mean too much other than the CF cards are larger and more rugged, yet prone to bending the camera’s internal connection pins. Handle either of them with care and it shouldn’t make much of a difference. Battery: The 60D uses the LP-E6 battery like the 7D and 5D, which is a nice feature as this battery can often last through a full day of shooting. The T3i and T2i use the smaller LP-E8 battery with less capacity. In any case you should have an extra battery or two. Size and Weight: The T3i is smaller and lighter (18.2 oz/515 g) than the 60D (23.8 oz/675 g), which in turn is smaller and lighter than the 7D (28.9 oz/820 g). Go to the store and hold them to get a better feel for their size and weight. HOWEVER, please know that the size and weight of these bodies is a result of their build, features, and capabilities. Those are the criteria that should be compared first, not the resulting size and weight. (Also be sure to read this post of Why How it “Feels” is not a valid Criterion for Choosing an dSLR.) But, I do realize that size and weight is important to some, perhaps many, due to physical limitations or just simple comfort and enjoyment. So take my dramatic proclamation with a grain of salt! The 60D and 7D “feel” like the more substantial cameras that they are. A nice improvement of the T3i is that its hand grip area has been modified, and has a different feel than that of the T2i – the area where the thumb rests is contoured differently and has a nice channel for the thumb, which allows for a much more secure one-hand-grip of the camera. AF Microadjustment: The 7D has this feature, the 60D and T3i and T2i do not. Many are disappointed that the 60D does not include the ability to micro-adjust the focus so that each of your lenses focuses extremely accurately. However, if you have a major focus issue, send your camera and/ or lenses to Canon while under warranty and ask them to calibrate them. Bad bodies and lenses are rare, but they do exist. Doing AF microadjustment yourself is often a maddening undertaking. You may make a good calibration under controlled conditions, but this really doesn’t replicate real life shooting. And due to manufacturing tolerances of both cameras and lenses, there is a relatively wide range of what is considered acceptable. If you need your camera and lens to be perfectly sharp, you are going to need to buy a $6000 pro body and a $1500 lens. See this article This Lens is Soft and Other Myths, its follow up article, and the follow up controlled tests to learn more about this. Locking Mode Dial: This is a new feature for a Canon dSLR, only on the 60D, that keeps the Mode dial from accidentally rotating. A nice touch, and not at all difficult to change quickly with one hand, as some people have claimed: just push the center button with your left index finger, rotate dial with thumb and middle finger. I actually wish my 50D had this. If you wish to retrofit your 7D or 5D Mk II with this feature, Canon will do it for $100. Full HD video: Of course they all offer this capability. Note that this is not video for your kids’ parties and soccer games. It does not have continuous autofocus while shooting, as a camcorder does. It is not designed for that kind of use, but rather for serious videographers who typically manually focus. You can adjust autofocus while shooting by pressing the shutter button or the AF button, but it may have a less than desired looking result and unless you are using an external microphone, the autofocusing sound will be picked up. The T3i has the digital zoom feature in video, which allows for nice smooth zooms while filming. Flash Sync: A Note to Strobists -the 60D and T3i do not have a PC sync flash socket to plug in PC sync cords. The 7D has this. Ease of operation: While beginners may find all the buttons, controls, and menus of any dSLR difficult and confusing at first, the additional controls and menus of the 7D and 60D are all quite intelligently designed, intuitive, and straightforward for the more advanced user. The menus and controls of the T3i and T2i are also pretty basic and simple to learn. There is certainly a “price of admission” to learning and getting the most from any dSLR, and you will need to invest time and effort into both reading and using/ experimenting with your camera. Start with the manual, then perhaps have a look at my e-book camera guides, then practice, practice, practice! Purchasing: If you plan to purchase any of these cameras, please see the Purchasing section below. Review / Comparison of Canon Rebel T3i vs T2i (600D vs 550D): If you are trying to decide between the Canon T2i or T3i, the previous model, the T2i, already shared many important features with the 60D (and even features of the semi-pro 7D) including the 18 MP sensor, 63-zone exposure metering system, high ISO performance, HD movie capabilities, and Digic 4 image processor. Now with the addition of the vari-angle articulating rear LCD screen (aka rotating screen), remote flash capabilities, creative filters, additional movie options, and in-camera image processing features, the new Canon T3i is even closer in specifications to the 60D, which may make your choice harder. But there are some important differences, and this post will hopefully help you decide which features are important to you and the way you photograph, which ones may be unnecessary, and thus which model fits you best. As I’ve said before, you need to choose which camera is best for you based on your needs and experience as a photographer and based on how the advanced features, controls, and customization options fit those needs and serve the way you work – not the other way around where you look at the new features and speculate if you really need or will use them. The Rebel T3i is replacing the T2i at the entry level end of the Canon line-up. (There is also the T3 in the most basic, entry level position.) The differences are minor but possibly significant depending on your needs. Since both cameras share the same 18 megapixel sensor and Digic 4 processor, both the T2i and T3i will create images with exactly the same image quality, produce the same low light-high ISO performance, shoot at 3.7 frames per second, and have nearly the same size and build quality. They are both offered with the same 18-55mm kit lens (with some minor cosmetic differences on the new T3i kit lens). The T3i is very slightly larger and heavier due to the addition of the rotating rear LCD monitor. And that is one of the biggest differences between the two cameras: do you want and need a vari-angle rear screen or not? The other major difference is the ability of the T3i to remotely control multiple off-camera flashes. Like the 60D and 7D, you can use the built-in flash of the T3i to trigger other Canon Speedlites. This could be an important reason for choosing the T3i. However, if you don’t use or plan to use one or more off-camera flashes, this shouldn’t be important to you. Some other minor additions to the T3i include the Scene Intelligent Auto Mode, which is a feature borrowed from point and shoot cameras. When in Auto mode, the T3i will make a determination of what type of scene you are shooting – close-up, portrait, landscape, etc. – and automatically configure the camera settings accordingly. However, if you want to use a powerful and costly digital SLR as a point and shoot, you should probably save the money and just buy a nice, high quality point and shoot like the Canon S95. Other additional but not very important upgrades include the in-camera processing Creative Filters like Grainy Black and White or Fisheye, and the ability to choose different image size ratios and to rate your images. However, this type of processing is best done on your computer with software like Photoshop or even Photoshop Elements. There is also a marginally helpful Feature Guide which gives brief descriptions of various settings and some additional video features like digital video zoom (for nice smooth zooms) and Video Snapshot, which you can use to shoot short video clips that are automatically joined together into a video, with music. Again, this is pretty easily done on your computer, and with much more control, with basic video editing software. So if you need any of these new features, get the Canon Rebel T3i / 600D. If not, buy whichever one if offered at a cheaper price. However, if you still wish to compare the Rebel T3i to the 60D and 7D, see below. If you wish to compare the Canon T3i to the Nikon D5100, check out this post Nikon D5100 vs. Canon T3i. Review of Canon EOS 60D vs. 50D: Since the Canon EOS 60D basically replaces the Canon 50D (well, replacement isn’t exactly the right word because the 60D doesn’t really follow the 20D to 50D progression of improvements…), the 60D or 50D decision is an easy one. The 50D shouldn’t really be considered anymore. While the Canon 50D does hold a couple interesting advantages over the 60D (faster frame per second (fps) burst rate in continuous mode, stronger construction, more comprehensive buttons and controls, complete lack of fun filters like “grainy black and white”), the sensor and exposure metering system have been greatly improved in all the newer cameras (such as the 7D or 60D or 600D/ T3i or 500D/ T2i) and I feel these features, along with the increase in megapixels, outweigh any other 50D advantages. I would definitely choose a 60D instead of a 50D. This is coming from experience, as I use a 50D professionally and on a weekly basis. Or choose a 7D instead of a 50D if your needs require it and budget allows it. (Find out below if your needs require it!) If you still wish to learn more about the differences of these two models, I write in more detail about the 50D vs. 60D comparison here from a camera features and operation point of view. Purchasing: If you plan to purchase cameras, photo equipment, books, or anything else from the retailers below I encourage you to do so through these referral links. While your price will be the same, they will give me a little something for the referral, which helps to support my blog and my work – thanks! I appreciate your support! If you are in the UK, please click here for the UK Amazon referral link. And if you are in Canada, please click here to use my Canada Amazon.ca referral link. These are all retailers that I have purchased equipment from (excluding Amazon UK/Canada), and I recommend them based on my good experiences, their extensive selection, competitive prices, great customer service and responsiveness, and fair return policies. See and buy the T2i on Amazon. See and buy the 60D on Amazon. See and buy the 7D on Amazon. Was this post helpful? Please let others know about it by clicking the Facebook, Twitter, or Google+ sharing buttons below, or linking to it from your blog or website, or mentioning it on a forum. Thanks! Want to help support this blog with no cost or effort? Simply click on the Amazon and B&H Photo logos on the left side of this page to go to those sites and make your purchases. They will then give me a little referral bonus! To me, the Canon 60D just seems like a nicer camera rather than the Canon T3i. I am a youtuber and I personally feel like the 60D is better for a youtuber. Thanks for your post. It is very informative and helpful. I find myself going back and forth between 60D and 7D but after reading your post 60D sounds like a better option. Would you please tell me major differenes between 60 D and 600 D? One new feature of the new T3i that you didn’t mention is the Custom Functions. I don’t know how well the feature is implemented, but I assume that it allows users to save their favorite setups for different situations. If this feature actually works, I think this is a huge advantage over the T2i. Do you agree? The Custom Functions (C.Fn) of the T3i are the menu settings that allow you to customize the camera – exposure level increments, ISO expansion, noise reduction, modifying the function of various buttons, etc. Most of the T3i Custom Functions are the same as the Custom Functions of the T2i. The 60D and the 7D have a far greater number of C.Fn options including more options to customize the AF system. In my e books (Your World 60D, Canon T3i Experience) I walk you through all of these options, with recommended settings. These are not the same as the custom C Modes on the mode dial of the 60D and 7D that allow you to save your favorite setups. The T3i does not have this feature. I’m deciding between the 60D & the T3i. The 60D kit comes with a 18-135mm lens (metal mount) and sells for $1199. The Rebel T3i kit comes with a 18-55mm lens (plastic mount) and sells for $899. I like the lightness of the Rebel T3i, but the 18-135mm lens is a better lens. The sales guy said he could swap out the 18-55mm lens for the same 18-135mm lens that comes with the 60D for an additional $300, bringing the cost to $1199, which, of course, is the SAME price as the 60D kit. I hesitate to pay the same price for a lesser camera, but the sales guy said I shouldn’t think of the T3i as lesser, that it’s really just as good as the 60D, and I should go with what feels more comfortable in my hand (which the T3i does, and “lugability” is important to me). I mostly will be using it to take pictures of my 6 month old baby. Right now I’m using an old p&s, and miss the shot more often than not. Advice? Either way, I plan to buy your e-book for whichever camera I buy. It is definitely worth it to get the 18-135mm lens instead of the 18-55mm. Better yet would be the 18-200mm lens, but of course that is even more money! When the T3i and 60D come out to the same price with the 18-135mm lens, it is a bit of a difficult decision. The 60D is a more advanced camera, with a more precise autofocus system, faster continuous frame rate, easier access to controls and viewing settings on the top LCD screen, more menu and customization options. It is a camera you won’t outgrow if / when you become a more advanced photographer, as you may outgrow the T3i. However, if those features of the 60D aren’t important to you, then the T3i may be a better camera for you based on its size and comfort. They both have a similar, if not the same, sensor, and the same exposure metering system, so the image quality will be the same in the T3i and the 60D. I’m having the same problem here! I’m debating between the T3i and the 60D. As Sophia mentioned, they are pretty much cost the same with the 18-135mm lens, but I really like the Scene Intelligent Auto Mode in a T3i and wondering if a 60D also has it or not? I’m a newbie so I would prefer the Scene Intelligent Auto Mode to help me out at the very beginning but I definitely plan to dive into learning its features later on. No, the T3i is the first Canon dSLR to offer this feature – Scene Intelligent Mode. The 60D does not have it. But that is nothing that special – it just sort of automatically decides which Scene Mode you are trying to capture, like Portrait, Sports, etc. It is kind of like turning your sophisticated dSLR into a point and shoot. You are better off learning the camera´s settings and functions from the manual or from a book, like my ebook Canon T3i Experience! As this will be my first DSLR so I’m wondering if the Scene Intelligent Mode will sort of taking care of the manual turning the function “wheel” between different mode? If it is what that is, I better off with the 60D then. Yes, the Scene Intelligent Auto Mode is similar to choosing a scene mode yourself – Sports or Portrait, etc., but the camera analyzes the scene and determines how it should tweak the settings. I content that it is always better to take control of the camera and its settings yourself, so that you can capture the image you wish to capture. One last question! Choosing a scene mode on a 60D will be as simple as getting the “wheel” function with the appropriate icon to the right place and the rest will be taken care of? I want the camera as simple as possible to take good quality pictures (setting aside all the special effects and technical advances for now) before I can spend more time learning it. And by the way, if I purchase 2 e-books: 60D and T3i, is there a special discount? Yes, that is correct – just turn the Mode Dial to the appropriate scene mode. I will email a discount code for purchasing two ebooks. Thanks! I got the email. I will get them as soon as I purchase the 60D for myself and the T3i for my cousin. I have been a happy owner/user of a 7D for a year now. I am going to buy a 60D as a second lighter body mainly to get the tilt screen for video which will help while walking around in the video mode. I find it impossible and dangerous to walk around through towns, cemeteries, battlefields etc while holding the 7D to my eye. I also want the locking mode dial, I have accidently changed my setting on the 7D and had to reshoot a few times. The lighter body of 60D will make a day out walking just a little easier. And finally, (don’t tell anyone) I love the minature filter on the 60D and the ability to add effects after shooting in camera while not ruining my original files. The RAW Processing in-camera is a time saver to try different white balances. So, like all modern digital imaging machines, time marches on and the upgrades are mostly very good improvements that make Life & Images Better! I believe that there are some LCD attachments that you may be able to put on the 7D that could help – which will project the image upward so you can view it from waist level, etc. Perhaps something made by Zacuto. I will look into that. Also, Canon will retrofit your 7D with a locking mode dial for $100. But, yes, the 60D will make a nice backup and alternate, lighter camera with virtually the same image quality. Thanks for the very detailed and helpful comparison though I’m still a little confused on several levels. One is because I didn’t quite understand the benefits (or usages) of all the different features. And two is because if and when I do learn how to use all the various features, will I quickly outgrow the Canon 60D and long for the capabilities of the 7D? At least that’s my fear. But I wouldn’t mind saving the extra dough – especially with that huge difference in price. But there is also something to be said for spending big bucks and getting a camera that can take some knocking around or at least an accidental fall. Back when everything was manual I enjoyed the flexibility of my Canon AE1P. And now I just want to relive that again and then some! I also really like cameras with the retractable lcd screens. Plus it doesn’t hurt to have video capability, having never owned a video camera. I am not a huge sports photographer but I do like shooting tennis at the US Open every year. Will the 60D capture all those fast movements giving me enough choices of desirable shots? And is the 60D as weatherproof as the 7D – like enough to shoot in light rain conditions? When I talk to the sales guys at the Canon counter at B&H Photo, they’re complete snobs in terms of the 7D compared to anything less. It’s just so confusing! But do I really need to spend so much money and it doesn’t even have the retractable screen??? Oy vey!!! If you are shooting with a basic (Rebel) digital SLR now, or even with a compact point and shoot, you should be able to see and understand some of the features you may long for in a new camera – for example quicker access to changing settings and controls, or the need to adjust how the autofocus system is tracking a subject. If you don’t understand their benefits, then more often than not you don’t need those features. However, when you consider the possibility of learning them and growing into them, it indeed makes the decision difficult because there are too many unknowns. Maybe you can rent a 60D or 7D from a store such as Calumet or from an online lens rental place, and try it out. A user with a 60D will be able to track and capture fast movements in a couple ways: 1. selecting a single AF point, using One Shot AF mode, and being quick and accurate or 2. learning how to track and capture subjects with all the points of the AF system and AI Servo mode. I was able to capture rapid dance action with a much more basic and far less accurate AF system of the Rebel XT. Often it is a matter of fully understanding how your autofocus system operates, choosing the proper AF modes, points, and settings, and then gaining some skill with operating the camera and timing. See the Dance section on my website here for examples of that, and these videos on Flickr to see how fast they were moving. But, yes, in many ways the advanced AF system of the 7D will be much better for action and movement if you know how to customize and use it. It has more focus points to locate and/ or track the subject, and more options as to how the AF points track and how they deal with new objects in the scene or objects that come between you and your subject. This can take some of the pressure off the photographer, but also surrenders a certain amount of control over to the camera, especially depending on how well the photographer understands how the AF system is working. And here is what can happen when even a pro, using a top-of-the-line camera, surrenders control over to their AF system: http://www.scottkelby.com/. So as you can see, a “better” camera isn’t always the solution to the issue. The 60D is weatherproof, but not as much as the 7D. The 7D could probably handle light rain better than a 60D, though in either case you would be wise to use a raincover like this one. If you really want the 7D with a rotating screen, you can always wait around for its replacement version, the 7D Mk II or whatever it will be! It may include that feature. Thank you so much for the very details review. I’m considering a new T3i vs a 60D. I really like the new feature “Scene Intelligent Auto Mode” in a T3i and wondering if a 60D offers it too? I’m glad you found the information helpful! It definitely sounds like the articulating screen is worth it for you. Can you share a link to some of your astro-images? Great article…Like many of the people above I am having a hard time deciding between the 60D and the T3i. I mainly shoot landscapes and only occasionally shoot a Football game, however I might shoot more during the next season I am wondering if the faster FPS is really worth the money. Where I live the price difference amounts to almost $500 and I was thinking it might make more sense to simply get a better lens. BTW…This will be my first DSLR I am upgrading from the canon SX20 is, which I loved but have simply outgrown in many aspects. Thanks for reading, and I’m glad you found it to be helpful. The faster frame rate of the 60D will definitely make a difference when shooting sports, although the super-fast frame rate of the 7D would be ideal for that! It is unfortunate that the price difference is so great for you, since in the US, it amounts to a $100 difference. However, you will probably want a better lens than the kit lens no matter what you shoot, so compare what the T3i body only plus the 18-200mm will cost vs. the 60D kit with that same lens. Since you can get the 60D as a kit together with that lens, you potentially save several hundred dollars, and the cost of the two options may even out. I currently have two T1i’s, a 70-200mm IS 2.8, a 24-70mm IS 2.8, and a 50MM 1.8, a speedlight 430 EXII flash and a 530 and a 1.8 extender. I have been satisfied, mostly, with my T1i’s but am intrigued by the newer models. I’ve read so much that it is all confusing to me. I was wondering what you think I would get more bang for my buck with: Two T3i’s or one 7D? I used to shoot a lot of weddings, but I probably wont do many in the next year or two. I’ll mainly be shooting projects for the oil company I work for, but want to have great gear if I go back to shooting sports, or family stuff for my family. I think you will get much more bang for the buck with the 7D. You could use one of the T1i’s as a back up if you wanted 2 bodies. The 7D will give you the incredibly fast continuous frame rate for shooting sports, it has the much more sophisticated, accurate, and customizable autofocus system for sports and action, it has a much more rugged and weatherproof body, and it has a much more durable shutter (rated for 150K actuations vs. 100K on the T3i I believe) that will last longer and thus will be more reliable in 3 years when you are in the middle of shooting a wedding or important event. It also has a faster flash sync speed so it is more versatile in a wider variety of lighting situations, and it should feel better “balanced” with the big lenses you have. Hope this helps. I’m planning to purchase the Canon 60D and am trying to deicde on which lens to buy. Do you recommend the Canon 18-200mm lens or the Sigma 18-250mm HSM lens or perhaps another lens? Does one produce better quality images over the other? Do you know if there is a difference in the build quality of the lenses? Also, I’ve heard there is a kit version and a non-kit version of the Canon 18-200mm – is this true? To be honest, I don’t know too much about Sigma lenses. I found a comparison of their specifications here, but that doesn’t help with the image quality question. Hopefully you can find a good image quality comparison site without getting bogged down by unreliable forum opinions. Unfortunately, they are both out of stock at the moment. And be sure to use my referral links to make your purchases! (or click on the store icons on the left side of the screen). Thanks! Best blog ever! I am a military photographer/journalist in the Marine Corps and we’re issued the 5D Mark ii with almost every L lens you can think of. The only photography I had done before this job was with a Nikon D50, so I definitely noticed the difference, but after reading all this, I realize that I haven’t tapped into what this 5D is truly capable of and as a journalist, I probably would never need to. That’s really good to know because I am looking into getting a Canon for personal use and thought I had to get a 5D (didn’t want to downgrade and have worse pictures). Now I know I can do the same things with the 7D or the 60D! Sweet! And I won’t have to sell my soul for all the L lenses I wanted to buy. $350 50mm 1.4 USM here I come! Thanks for reading! I’d love to hear more about your photography work and photojournalist experiences with the Marines. Let me know if you’d be interested in perhaps writing a guest post! I was sold on the 7D until I read this post and now I am wavering between the 60D and T3i. I have never owned a DSLR; however am avid still photog continuing to shoot FILM on my Nikon F3, Rolliflex medium format and converted Polaroid Land camera along with an array of nice digital point and shoot cameras (started with Canon G2 and evolved from there). I shoot lots of video as well and my embarrassingly old SONY TRV-900 (first prosumer 3 CCD camcorder) is way out of date. Why 7d is OUT (for me): I definitely need the swivel action on LCD panel for video and stills… and I don’t need super-ultra-fast burst mode. I’m not shooting tigers in the wild or tennis babes. So – 60D or T3i? PS – Very good article and informative discussion thread. Thanks for your article, blog and detailed comparison. After research and your article I have ordered 60D. I think the one thing that you didn’t mention the 7D is the 100% viewfinder. For some this may be critical. Yep, it is mentioned in the Viewfinder section, but thanks for pointing this out! Just discovered your great comparison. Lots of useful info! I’m wondering about the focusing in live view, I heard it’s painfully slow. I shoot product photography, and flip out screen with live view is handy to have for composing, etc., especially when not shooting tethered. Is live view useable, or do I have to keep flipping the mirror with these Canons? Access and set the Live View Autofocus Mode in the Shooting 4 menu. Remember to Enable Live View Shooting in the Shooting 4 menu. The camera uses the image sensor (not the autofocus sensor as with viewfinder shooting) to focus on the area under the large AF Point seen on the LCD Monitor. You can use the Cross Keys to move the AF Point, or the Set Button to return it to the center. Press the Shutter Button half-way to lock focus. It is often slower and more difficult to lock focus than viewfinder focusing, as you can see through simple experimentation. (no mirror flip with this mode). With this mode you use the multiple auto focus points, similar to the viewfinder AF Points, as displayed on the LCD Monitor. Since the camera is using the autofocus sensor to focus, it momentarily interrupts the Live View on the LCD Monitor when it flips the mirror back down to access the AF sensor. It is quicker than Live Mode but noisier and you briefly lose sight of the scene on your LCD Monitor. To select a specific AF Point, press the Q Button and then the up or down Cross Key to navigate to Manual Selection, then turn the Main Dial to select your desired AF Point. Press the Shutter Button half-way to lock focus. This mode works like Live Mode but locates and focuses on faces, kind of like turning your powerful camera into a point and shoot with the face-detect feature. Press the left or right Cross Key to select a different face. Press the Shutter Button half-way to lock focus. first off, i’m high as s**t…secondly this was probably one of the best blog comparing a huge range of dslrs…i thought your wash machine with the Swahili buttons analogy was funny as s**t.
please please please help me sir..
i want to buy a camera to make a living by doing product and commecial photography with some video on it. Hello, if you plan to do professional photography for paying clients, you will need a professional-level camera, which would be the Canon 5D Mark III. This is because it provides the image quality, low-light/ low noise performance, the customization options, the professional-level video, and the durability that you will need (both in terms of build quality and shutter life/ durability). And you will need some top of the line lenses, which are the Canon L-lenses. As you will see, these are all very expensive! So if you wish to work your way up to that level, you can start with the Canon 70D, which has excellent image quality and video performance, and most all of the features and options you will need at first. And perhaps start with one top lens, such as the 24-105mm f/4L or the 24-70mmf/2.8L. And you will likely need the 600EX-RT Speedlite flash. So as you can see, professional photography is not just something you can jump into, but rather may be something you will need to work up towards more gradually! sir thanks a lot for you message. but i think ill have to drop my idea of this career becaus i do not have money now. i am able to afford the 60d as of now or nikon d7100( how is it ?) .. Either the 60D, or better yet the Canon 7D or Nikon D7100 might be a good place to start if you wish for this to be a serious endeavor. …and it was still a couple years after that when I was able to quit my day job. So for example, you may start working with a less expensive pro-sumer camera and lenses, and then rent the necessary camera and lenses (such as from LensProToGo) when you need them, but be sure you have fully learned in advance how to use the equipment. I don’t wish to be discouraging, and it can be done, but know that it takes a lot of sustained effort and dedication, especially for the first few years. I want to upgrade from my XTi and have been pulling my hair out trying to decide what to get – at least now I’ve narrowed it down to the 60D or the 7D! Glad I could help! What are you looking for in a new camera? How do you plan to use it? What is your experience level? You would want to consider the 7D if you shoots sports, action, and other stuff that can take advantage of its sophisticated autofocus system and rapid continuous shooting rate, and if you want and need a higher level of customization for how the camera and its controls function. has anyone said anything about the weight of the 60D? I bought it and regret it cos its so heavy. Thinking about changing it to a T2i or T3i – views? The T3i is smaller and lighter (18.2 oz/515 g) than the 60D (23.8 ox/675 g), which in turn is smaller and lighter than the 7D (28.9 oz/820 g). Finally, an easy to read article about the three cameras. My only dilemma appears to be the lack of ISO with my Xsi. Thus, I need to move up to do any indoor sport shooting. With that being said, I have finally ventured into the AV, Tv, and M modes and and starting to realize their benefits. However, I do not really understand the need to go to the 60D if the T3i has basically the same option. Would love the 7D but it is a price thing right now. The 60D will give you the faster continuous shooting speeds that are great for sports, plus with the 60D all the AF points are all cross-type and more accurate, where the T3i just has the cross type center AF point and the outer ones are less accurate. Yes, the 7D would be ideal for sports/ action! Thanks a lot for sharing your knowledge with us! I have been considering getting a DSLR to upgrade my videos and was heavily considering the 60D, but wasn’t sure what the differences were between it and the T3i. Now I know!! Huzzah for the shopkeep! Huzzah! Thanks for reading! Spread the word: Facebook, Twitter, forums! Thank you for sharing your photographic experience with us. I’ve always loved Canon and never had much sympathy for the ergonomics of the Nikons. Do not fit well with the controls and not with the “footprint” of the grip and Nikon. I think you also prefer the Canons. I bought your e-book Canon T3i Experience and loved it! It helped me a lot! I have a question: If the difference between the 60D and T3i is only 100 USD is easy to decide by the 60D. But in Brazil the difference between the two cameras is 550 USD (60D). I bought the T3i, but I’m not so sure of having made the right purchase. I am a physician and photograph animals in the house, at the zoo and music shows as well as trips and sunset. If the difference in this country was of 550 USD you have bought the 60D? It is worth exchanging machine paying such a big difference? Yes, $550 USD is a significant difference. Right now the difference here is $250 more for the 60D (camera body only) or $350 more (with lens). The quality of the photographs with the T3i will be exactly the same as the 60D, so the difference will be the controls and some of the features of the camera. For your needs, it sounds like the T3i will work great. You would want to consider the 60D if you need a faster continuous shooting speed, a larger body with direct access to more controls because you are changing the settings often, such as ISO, metering mode. However, the T3i lets you change the settings very easily with the Q button and Quick Control screen, so that isn’t a major issue. I attempt to explain all the differences in the article above, so I don’t what what else I can add to help you make your decision! Yes, the 60D offers several additional menu and Custom Function items and additional buttons and controls. But the basic and essential functions of the T3i and the 60D are very similar. Consider the David Busch guide to the 60D, and the “From Snapshots to Great Shots” book for the 60D. Hi I am really new to this and I own a canon powershot G9. I’m into nature photography as well as underwater photography. I plan on upgrading and buy myself a dslr. I’m between 60D and T3i, I have friends with 60D and the photographs are just amazing but I think the lens are what makes it more amazing. For a beginner such as myself which do you recommend? Are lens more important than the body? Hello, Regarding the T3i and the 60D, they share the same sensor so the image quality of these two cameras will nearly exactly the same. If you don’t need the advanced features and controls of the 60D (as described above) then the T3i with a very good lens may suit your needs well. In general, since most all dSLRs of all price ranges now have excellent sensors, the lens can make a difference. But learning to use the camera, control the camera, and take advantage of its features is just as important for good images. Plus knowledge of lighting and composition. I think I might go with T3i thank you :) but one more thing (sorry) they said that the lesser the digit the better. Is that true? and do you have any suggestion for nature photography lens? What do you mean by “the lesser digit”? I apologize I do not understand the question! As far as a lens for nature, it depends if you like to photograph wide vistas of the entire scene (a wide angle lens) close up details (a 50mm f/1.4 lens), or wish to zoom in close to objects far away (a telephoto zoom such as the 70-200mm). If you like to do all those things, consider the Canon 18-200mm lens. Ah, I understand. Yes, as you can see by the prices, the 1D is at the very top, then the 5D, 7D, 60D, 600D. However, eventually they are going to run out of numbers that make sense for this system, and have to change this, such as the rumored 6D and 3D. Hi! Thank you very much for this guide, it was what I need it, cause I was between 600D and 60 D so this help a lot. Anyway I want to ask you, which of this two would you recommend for a professional photography? I’m asking this cause we have to use the cameras in manual mode all the time so I think for what you said, that would be harder with the 600D. For professional photography, I would recommend the Canon 5D MkII, or at the least the 7D. The 600D and the 60D are consumer level cameras that don’t have the capabilities and durability required for pro photography. But if those are out of your price range, or you are just starting out with little or no dSLR experience, but you fully intend to devote yourself to photography, you will want to choose the 60D. Either of those cameras (600D and 60D) can work in Manual mode just fine and just about the same in many ways, but if you are going to be accessing many of the other essential settings like metering modes, drive modes, dealing with exposure compensation, etc, the additional controls and top LCD screen of the 60D are designed to make this all much easier on-the-fly. While the image quality will be the same, the 60D offers more direct controls on the body of the camera, in order to quickly change and review the camera settings on the fly. While as a beginner you may not make use of them, as you learn and develop, you may find that you will want these types of controls. The 60D also has a more accurate autofocus system, as well and more Custom Functions which allow you to customize exactly how some of the functions and controls of the camera operate. Again, just starting out you may not make use of them, but as you grow you may find that you want more control over how the camera operates. If you just plan to work in Auto mode or the scene modes, the T3i is more than sufficient. And it is highly capable and can do much more than that if you do wish to take control of your camera and its functions. The 60D will allow you even more control. Your article is fantastic and offers the best comparisons that I’ve seen! Thanks. I am a still photographer who likes to work as intuitively as possible with lighting, etc (I still work a lot in in B&W film with a Canon F1). My main concern is getting the most sharp, detailed images (sometimes in low light). I have an older xti with an still older EF 35-135 lens, a combination that I use for its light weight and convenience and low light capacity when I travel. Is now the time to upgrade the digital? Will the image quality of the new Canons be so much better? Will the quality of high ISO shots be so much better? I’m considering the EF 70-200 f/4L IS lens for a Safari. Do you think this is a good bet ? Thanks. Thanks! Please don’t hesitate to share this article via Facebook, Twitter, etc!! Yes, I think an upgrade from the XTi will be well worth it at this time. The metering system has improved (63 zone now), and the sensors perform much better in low light with less noise. You can use the tools at dxomark and dpReview to compare the sensors or images from these cameras. Plus the increase in megapixels will allow you to crop and edit your photos more aggressively. For a safari I would suggest the 60D or better yet the 7D, which has the more sophisticated AF system and faster frame rate for capturing motion. Of course this also depends on what degree you have taken control of your XTi and pushed it to its limits. If you don’t feel you need the additional features and controls of the 60D or 7D, then the T3i may be a sufficient upgrade – though at this time the T4i (or whatever) would typically be coming out in Feb 2012 and you may want to wait. Although with the disasters, damages and disruptions in Japan and Thailand it is difficult to know if this schedule will still apply. Whatever you decide, please consider using my affiliate links to Amazon or B&H, etc. for purchasing, and have a look at my e-book camera guides to help you learn and take control of your new camera!! After 5 years of shooting with my Canon 20D I finally wore it out and after weighing the cost of a new shutter and circuit board I’ve decided to get a new Canon. I’ve been reading reviews on the 60D and the 7D and kept waffling back and forth but after reading your excellent review here have decided to go with the 60D. Good job! Wonderful! I’m glad I could help. Please consider using my Amazon links to make your purchase, and don’t forget about my “Your World 60D” eBook! I read your article with great interest, but I’m still questioning which camera to take. I would use the camera especially for video purpose. The possibility of filming in full HD, with such a great sensor is just delicious. Still, it is hard to choose to take a smaller model, to improve my filmexperience with a dslr (normally I film with handycams..), So I could opt to go first with a ‘cheaper’ model, and after a few years investing in a big model. I don’t do much dSLR video work yet, but I think the same criteria as described above would apply: since the sensors and image quality of the T3i, 60D, and 7D are similar, you will need to have a look at the additional controls and additional menu and custom function options of the mid-level models to see if they are something you will need. I would recommend the 60D over the T3i since it will provide easier access to full manual control, which is generally what you want for video. If you are really serious about it and wish to do professional or semi-professional videography, I highly recommend the 5D Mk II, or even wait for the 5D Mk III which may be announced as soon as Feb 2012. Well, the 5D is really awesome, especially the full frame! But, the price is ‘slightly’ higher than the other types, so this is another great investment that I have to consider. I think that trying the gear can also help in deciding.. Thanks a lot! Your article helped me! I own the Rebel T3i but I got this offer to buy the 5D. It is worth the switch? Is there more pros to keeping what I have than get an older 5D model? I use my camera to shoot portraits and family. I own three lenses, one is the EF 24-105mm f/4 L IS. Thoughts on whether it is worth it or not? That is a challenging question. I assume you mean the 5D original? Or is it the 5D Mk II? The original 5D is still a pretty amazing camera. I’m not sure how the image quality compares to the T3i, but you can do a comparison on dxomark. I suspect that it has as good or better high ISO/ low noise performance. And its full frame sensor allows your wide angle lenses to really act as a wide angle. The autofocus system of the 5D is likely noticably slower than the T3i, and not as good in lower light situations. And the 12 MP of the 5D is just barely enough to still be viable too at this point. I think in the long run, if you really want to upgrade, you would be better off with a 5D MkII or even a 60D or 7D. While the 5D is great, it is on the borderline of being just a bit too old at this point. Maybe when the 5D MkIII comes out soon, you can get a 5D MkII for a great price. Sorry I don’t have a solid answer, but perhaps this info can help. Great article. I came here to compare the T2i vs T3i. After reading your article I decided the T3i was better for me, only now I’m torn between the T3i vs 60D. Now I have to go back to all the other digital camera review sites & read-up on the 60D. Originally I didn’t want to spend over $1k on a new camera & lens but the 60D w/lens is not much over $1k. Another difference between the T2i, T3i and 60D – MagicLantern firmware works best with the 60D, then in descending order T3i then T2i. Though from my understanding, again the differences are minimal. Well I’m glad I am helping you in the process of finding the camera that is the right one for you! That is always my main goal. Again thank you so much to putting so much time in to your articles here. Looking forward to reading your ebook. Thanks for the informative and enlightening article… It has actually thrown more light into what I’ve been so concerned about. Never used a DLSR camera before but planned getting one. A friend wants to sell a used canon rebel xt with 28-300mm sigma lens to me. I intend buying it if the price is worth it, I also want to get the 7D. Can I use the xt lens on a 7D body and still get a great picture quality, or do you advice me getting an L lens. (Just considering the cost implication on me). Hello, thanks for the nice comments! The Rebel XT is pretty outdated at this point, and with only 8 megapixels, it is not really even a good back-up camera. They also have a limited life-span, and depending on how many photos have been taken with it, it may not last much longer before something goes wrong. If you plan to get a 7D, just save the money by not getting the XT, and buy the 7D. I don’t know much about the Sigma lens. I would imagine with that broad focal range at such a low price, it is not a very high quality lens. You don’t necessarily need an L lens for the 7D, but at least a high quality lens. The high megapixel sensor will definitely show the limitations of a cheaper lens. Since you generally “get what you pay for” with lenses, that means perhaps a $800 or more lens. I have several posts about Canon lenses you can read to learn more. Hi and thanks for a very written article. Am trying to choose between the 600D and the 60D. I currently have an S3IS which I’ve used extensively for my travel photos. Mostly shoot Tv,Av and M, and am looking specifically for the more accurate AF and better ISO the dSLR would offer over my current camera. Though I agree the 600D covers most of my needs (I really dont need the higher FPS or the extra 9-point cross type AF), I have one doubt – The dial of the 600D doesnt have the bulb ‘B’ mode, which the 60D has. Can you please tell me if the 600D has a Bulb mode (hidden somewhere in its menu options)? I ask so as one of the reasons for my upgrade would be to shoot star trails, which I simply cannot with my S3, and dont see how with a camera which doesnt offer more than 30sec. exposure time. Again, I plan to buy a remote control which would be compatible with Bulb mode. Somewhere I read that wireless remotes do not support Bulb mode and only the wired remote does so. I would appreciate your comments on the same. Yes, the T3i has Bulb mode. You set the Mode Dial to M, and then turn the top dial until it reads Bulb on the display. Thanks a lot for your advice. that will surely help me make up my mind. Hi , thanks for your lovely blog. I have scoured the Internet for research before imminent purchase of Dslr. I must compliment you on the way the blog is written and the easy way that information flows. Please carry on the excellent job. This Slr will be my first one , having had only point and shoots earlier . My wife and I do enjoy photography but until recently have somehow resisted buying Slr for convinience of carrying a small camera. The main object is going to be my 2 year old toddler who is very active and will barely stand in one spot for long and holiday pics, however we would like to develop this further as it is something that interests us and would be definitely buying your books. We have saved up and can go for either of the cameras mentioned before or any other you would recommend but my main concern is fast autofocus for a toddler really, sometimes we would want to autofocus fast on live mode as well. I am not convinced about the Sony alt camera for this . Which camera and which lenses would u recommend ? Thank you for your kind compliments! I believe that the T3i will satisfy your needs, as well as being relatively small and lightweight (for a dSLR). If you really plan to get into it, and study and learn and be serious about dSLR photography, you may wish to start out with the 60D, but for photos of the toddler and everyday shots, the T3i should fulfill all your needs. ALTHOUGH, the T4i is expected to be announced any day now, so you may wish to wait and see what additional features that offers, and how the price of the T3i will be affected. Any of these cameras will take the photo immediately, unlike the delay of a point and shoot, and the dSLR cameras will autofocus quickly and accurately – though it helps to have a high quality lens. I’m not a big fan of the kit lens, as many people find it limiting in terms of reach and quality, so it may be better to start out with a higher quality, all purpose lens such as the 18-200mm. Or if you don’t need that much zoom because you are often working in close, then the 17-85mm 15-85mm. The 50mm f/1.8 is also a great quality lens for low light use without having to use a flash, and its f/1.8 max aperture will give you those great background-blurring results. Autofocusing in Live Mode is a bit slower and more cumbersome than when working through the viewfinder, so with an active toddler I recommend learning to take control of the autofocus system and work through the viewfinder. Going through your blog on the one travel lens you also recommend the 24 – 105 mm L lens. My concern with the 18 – 200 was the lack of USM. Do you think in my case the USM will add to the speed of AF. However with the afore mentioned L lens the widest angle seems to be 24mm , and obviously sometimes i may need to get a shot at a slightly closer range and then the 18mm would be better . i could get the 60d/t3i or t4i with 18 -200 offered at ‘kit’ lens or 60d with the standard kit and then go for the L lens. Remember that with lenses, as with dSLR cameras, it is all relative. Of course the 7D is “better” than the T3i and the 24-105mm f/4L is “better” than the 18-200mm, but if the less expensive one meets or exceeds your needs, you don’t necessarily need to spend the big bucks for the “better” one. You can generally use price as an indication of quality, so as you compare lenses with similar focal ranges, get the best one you can afford and that you think you actually need. I’m not sure exactly how much the USM feature adds to the focusing speed. A couple good sites to read technical reviews and comparisons of these kinds of specs is of course DP Review, and also http://www.photozone.de. If you are going to get one of the L lenses, I would suggest not bothering to get any of the kit lenses, but instead just get an L lens in the focal range you think will be most useful for the types of images you will be taking. I have several articles about lenses (that you may have seen) that should help with this decision, in the Lenses Section of the blog. This is the best comparison of these cameras I have seen to date and I have looked until I’m cross-eyed! I am shooting with a 500d/T1i, I have the 28-135mm lens, a 50mm 1.8, and a 70-300mm L. We shoot mostly our kids in sports action, baseball and softball, football, track and field all outdoors and basketball, volleyball and swimming indoors. The addition of the L series zoom has helped significantly with image quality on bright sunny days but the high ISO noise on the 500d is playing havoc with night game photos. I do some nature shots as well, mainly macro flower pics and I’m sure both options will suffice with that area. The sports mode works well in sunlight on the 500d but suffers as the lighting goes down. I seem to have better luck with the full manual mode than my wife does and I know that is a matter of her taking time to learn, such as using one of your e-books. I’m thinking that the easy to find single button functions on the 60d may help her with that learning process. Thank you for your info and any suggestions as to the better camera choice for our situation. I would not recommend the 50D at this point. I don’t think you will see much improvement as far as noise over your current camera. And the image quality and high ISO performance is noticeably improved with the 60D over the 50D. Of course, the faster shooting speed and more accurate AF system of the 60D will be nice. Perhaps wait a bit for the next version of the 60D (70D?). It will likely show much improved high ISO performance over your current camera, and will be a more worthwhile investment. No work yet on when that model is expected though… Based on past schedules, it should be soon. Thanks for your insight. I would love to say I could wait but I must be honest, I have no patience – guilty of the old “I want it yesterday” mentality. Do you think the better choice would be stick with the 500d and pick up a better zoom for indoors? maybe a 70-200mm f2.8? or keep the 70-300mm f4-5.6 L and grab that 60d? I think the 70-200mm f/2.8 lens will help with your low-light indoor and night-time images more than a new body (such as the 60D) would help. Plus the lens will last forever, and you can always upgrade the body in a year or three. I have been reading your blog regarding the difference between the Canon 60d and the Canon 7D. I am a current user of the T1I and have been itching for an upgrade. I do quite a bit of traveling and shooting, Alphabet Art, Graduation Photos and Family Pictires using my T1I. My passion is landscape, wildlife and Macro (flowers, bugs, etc) I just started reading the differences between the 60D and the 7D and I am still not sure which I will like the best. I am planning a two week trip to Alaska in May of 2013 and would really like to travel with two cameras (one being my ole stand by T1I). Concerned if my lens will fit the 60D or 7D. What I believe that I have read, they will. Can you give me any insight as to what you think I would be best at. On another note. I do have a great eye for photographs but I really need to learn more on editing. Can you recommend an editing tool (software) for me. Thanks. Thanks for reading! I think either camera will do a great job for your needs, and they both have excellent image quality. The reason why you would want to consider the 7D is if you are going to be shooting lots of fast action, sports, birds, running wildlife, etc. This is because it has a more sophisticated autofocus system designed for these situations both with its increased 19 AF Points, and its ability to customize and tweak exactly how they react to best fit your subject and shooting situation. In addition, it shoots a speedy 8 frames per second, which is generally overkill unless you are capturing fast action. Any Canon EF or EF-S that fits the T1i will be compatible with the 60D or 7D. For editing, you should have a look at Adobe Lightroom and / or Photoshop. Lightroom is designed for photo editing, and may do all you need. Photoshop can do all the photo editing stuff too, plus adds image manipulation capability to that, such as adding or removing stuff or adding text. One new feature of the new T3i that you didn’t mention is the Custom Functions. I don’t know how well the feature is implemented, but I assume that it allows users to save their favorite setups for different situations. If this feature actually works, I think this is a huge advantage over the T2i. Off the top of my head, I believe that the Custom Functions of the T3i (and T4i) are similar to those of the T2i. They have perhaps added a few more Custom Functions to the T3i, and still a few more to the T4i. But with all of these cameras, you are able to customize a few of these types of functions and features to your shooting needs and preferences. Looking at the T3i, T4i, and 60d, which would be better suited for astrophotography? Sorry, I don’t know anything about astrophotography, but I do know that there is a Canon 60DA designed specifically for astrophotography. Many congrats about your blog!Your articles are very informative,well-written and comprehensive!Thank your for that! I’d like to ask for your help in a dilemma I’m facing; I am a newbie in photography and I want to buy my first DSLR,unfortunately I’m on a tight budget,so I ended up between canon 60d & 600d. From everything that I’ve read I much prefer the 60d,but due to economic difficulties the decision isn’t that easy. So I’ve found the 600d with twin lens Kit 18-55mm II & 55-250mm at the price of 478€ and the 60d with Kit 18-55mm at the price of 548€ .As you see the price is almost the same.Which one should I buy? Of course in the future(hope not very far) I’m planning to purchase better lenses,but which option is the best at this point? I believe I have to mention that I want to devote myself seriously to photography,I’m more interested in social,street,documentary photography and photojournalism. I’m hesitated about 600d,’cause I don’t want to outgrow my camera soon.. Yes, I would suggest the 60D, so that you don’t outgrow the camera in a year or two, or even sooner, as you mention. As far as the lens, I would suggest starting out with a better lens right away, rather than buying a cheap lens now, and then a better lens later. I would suggest the Canon EF-S 18-200mm f/3.5-5.6 IS. It is a decent, all purpose lens that will cover you from wide to telephoto. I have several posts here about lenses and choosing a lens that go into more detail, but the summary is that “you get what you pay for” with every lens, and you might as well start out with the good lens, rather than upgrading later and simply spending more in the long run. There is also an all purpose Tamron lens, the Tamron AF 18-270mm f/3.5-6.3. I don’t know much about it, but you should check it out to see if it is worthwhile. Thank you so much for your reply and your suggestions! !I agree with what you said,so yeah I’ll go with the 60d :) The thing is that,unfortunately,right now I can’t afford to give 300€ extra to buy the lens you proposed.I hope that the lens that comes with the camera will do for a while,at least until I save some money and get a better knowledge of photography. PS I wanted to ask you,could I send you an email,’cause I guess this post isn’t the right place for it,to give me your opinion/advices about sth?It’s obvious that you have lot’s of knowledge around photography in general and a valuable opinion.